The Kellogg School MBA Update & Leadership Series continues this winter and spring, as the popular daylong “refresher” course brings the Kellogg classroom to alumni around the world. With Kellogg thought leaders sharing their expertise and insights, MBA Update offers Kellogg graduates a special opportunity to benefit from the latest faculty research. On Feb. 8 in New York, Robert McDonald, the Erwin P. Nemmers Distinguished Professor of Finance, presented “Understanding Derivatives: The Key to Financial Decision-Making” as part of the MBA Update series. Participants included Wall Street veterans, as well as alumni from nonfinancial fields who desired greater understanding about how derivatives impact their business. Prof. McDonald’s recently published text, Derivatives Markets, served as the foundation for his morning lecture, and for the afternoon discussion led by a panel of Kellogg alumni and attendees. Additional MBA Updates are scheduled for April and May, bringing senior Kellogg School professors to you. For more information, go online. In March, Kellogg celebrated the naming of the Robert B. Duncan Forum at the James L. Allen Center. Duncan was former Richard L. Thomas Professor of Leadership and Change at Kellogg, and is now dean of Michigan State University's Eli Broad College of Business. 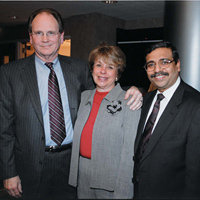 Pictured from left are Duncan, his wife, Susan, and Kellogg School Dean Dipak C. Jain.